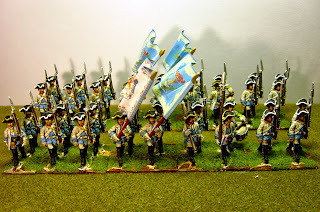 Here are some 25mm SYW (mid-war) Saxons from Eureka in Australia. 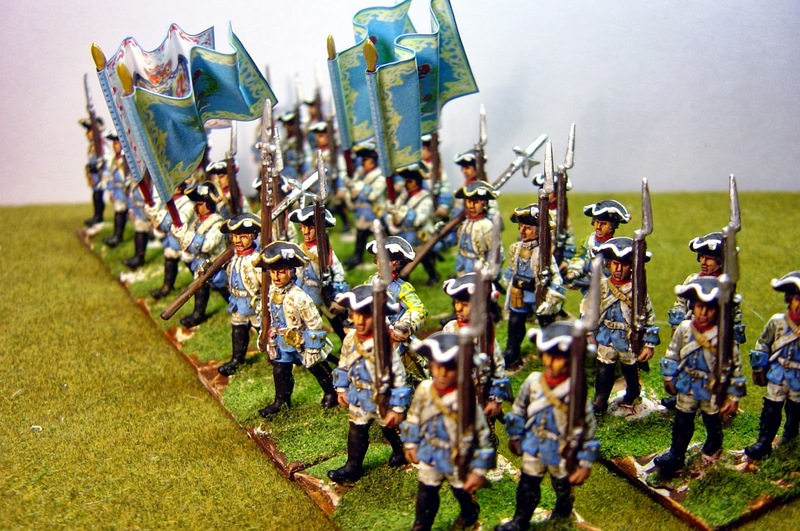 They are two battalions of regiment Prinz Xaver plus a grenadier company with each battalion. 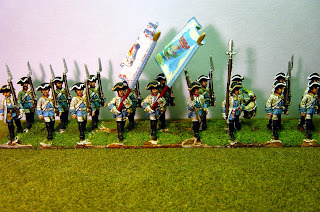 They are in their post-Pirna disaster uniform with the only difference being the grenadiers who have lost their mitres and now wear the plain tricorne. This is how they looked in French service in the Western theatre (at Minden for example). 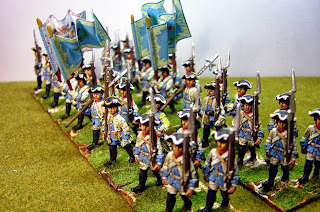 After Pirna they had been conscripted en-masse into the Prussian Army, which they promptly deserted, so they could only serve with the French without breaking their parole. 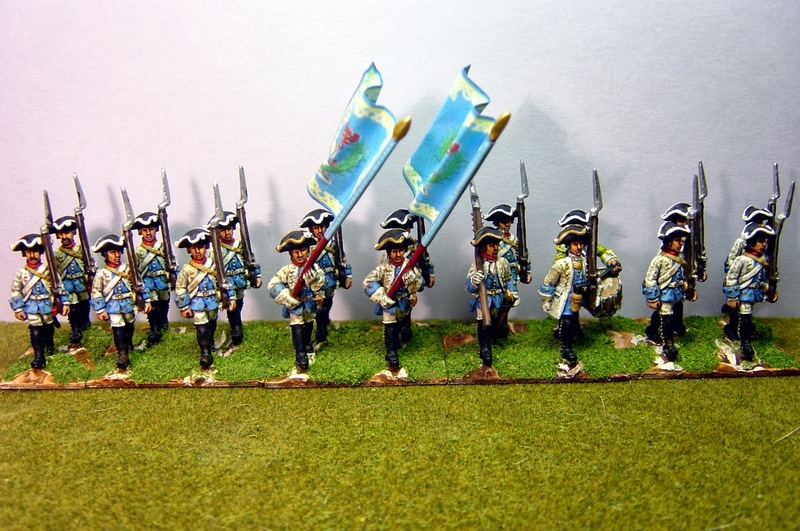 By 1761 they appear to be serving alongside the Austrians and their grenadiers had been issued Austrian style Grenadier bearskins. 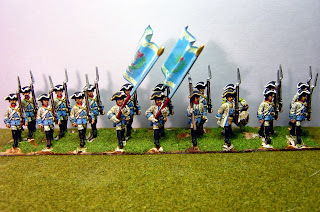 In French service the only distinction I can find for the grenadiers might have been red sword knots and, perhaps, moustaches, but this is conjecture on my part. Eureka are to be congratulated on making Saxons as nobody else does. But there are some small errors in the uniforms and I can only wonder whether Kronoskav was available as a source when they produced this range. 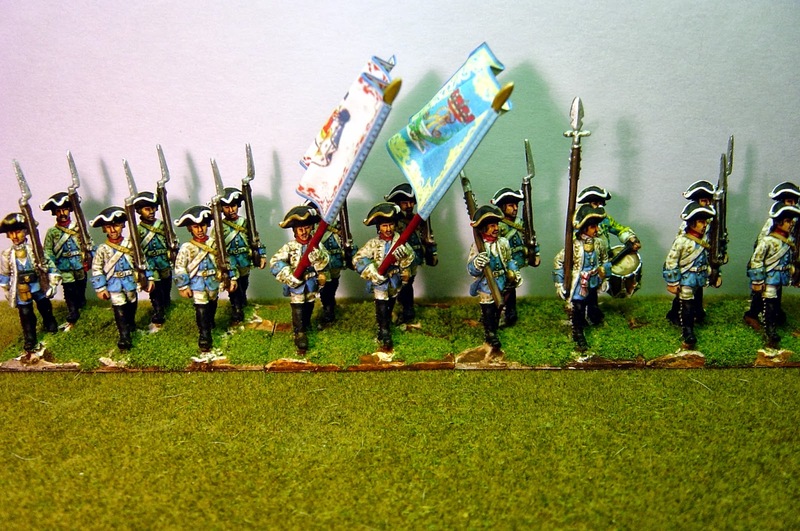 The details are all small and don't detract from the figures but I'll point them out anyway – there should be a pompom and a cockade on the tricorne and there isn't. I've painted the cockade in. The cuff buttons are horizontal on the figures and should be vertical. Despite these small matters the figures are charming with lots of character. 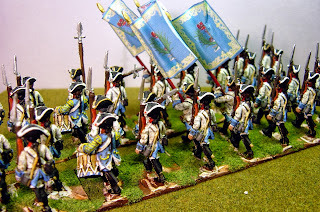 These were painted a few days ago but I've been waiting for a tin of Army Painter to arrive which it has. A few months ago I decided to try to make my own as the tins kept on drying out but the experiment was a failure so I'm back to using this product which, for white uniforms, really makes a difference. I've decanted the tin of Army painter into two glass jam pots in the hope that I can keep this product useable before it dries rock solid – I'll let you know if that works. On the same subject, I've used this product very sparingly (almost a dry-brush) over the white coats and trousers only so perhaps you will let me know what you think and whether it is worth all the trouble! 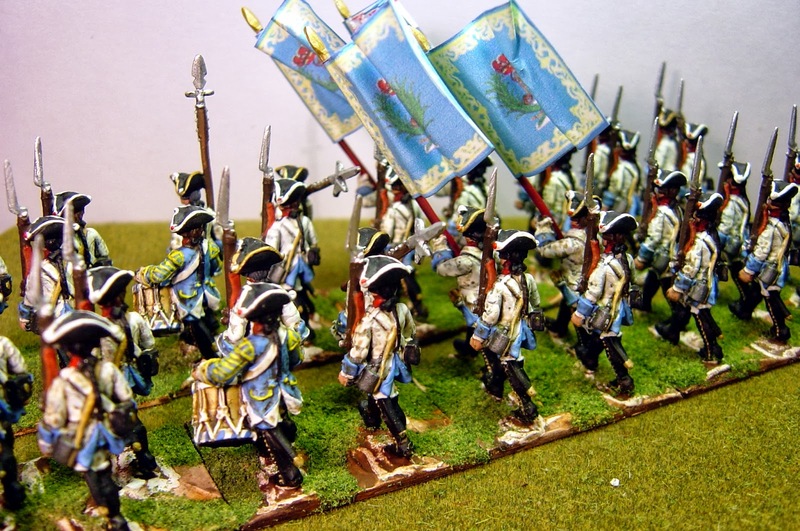 OMG, this is indeed a fantastic regiment - how accurately you painted them with their special blue-grey-tone "Bleu mourant". Compliments!! These look very nice indeed. 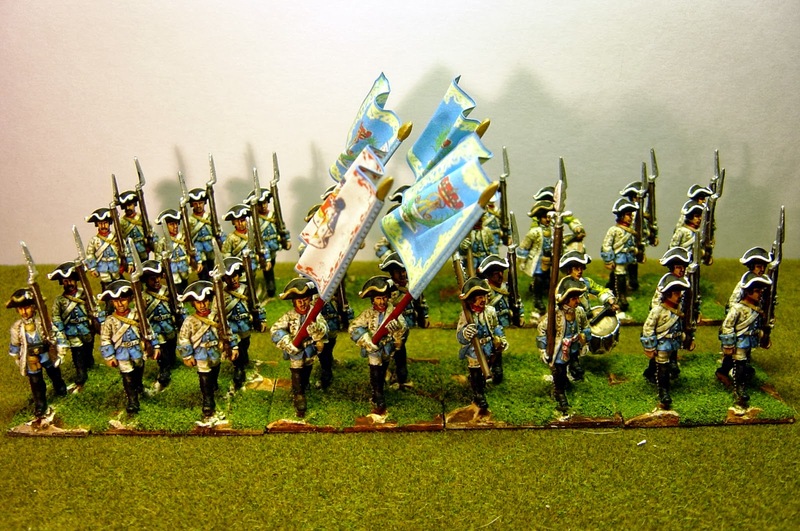 Like you I'm a fan of Army Painter Quickshade on white, it gives the uniforms a more "lived-in" look - keep at it. no kronoskof around when I did the research for these. Can I ask about the flags. Are they sold somewhere?